I am a little late with my report, but little late than never. 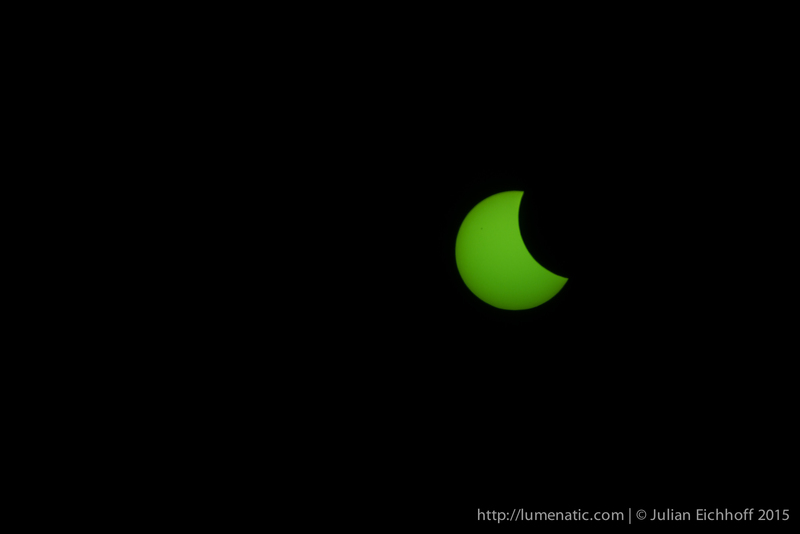 During the solar eclipse on March 20th 2015 I took some photos of the event. The results are ok, although I could have done better in my opinion. I have to admit that I did not prepare very well for the event. 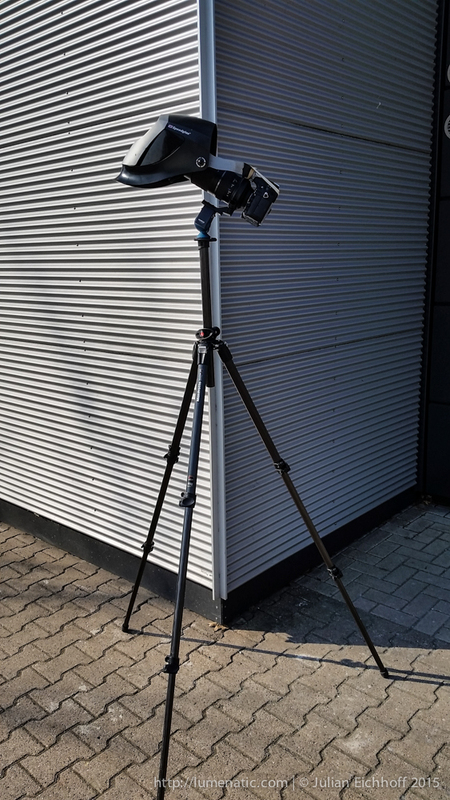 I missed buying one of those solar filter foils, which come at a price of 25-30 € for a 20×30 cm sheet. 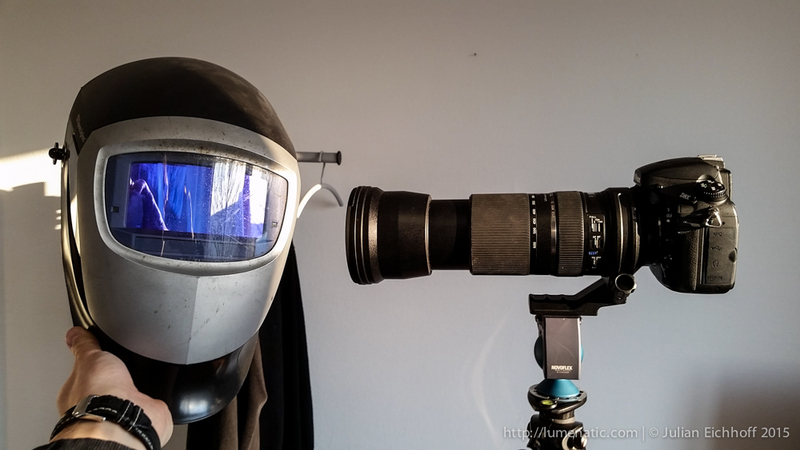 The day before the eclipse (ahem, yes, that’s late) I started looking for a solution and the only thing I could find in the nick of time was a welding mask, borrowed from the workshop at my workplace. 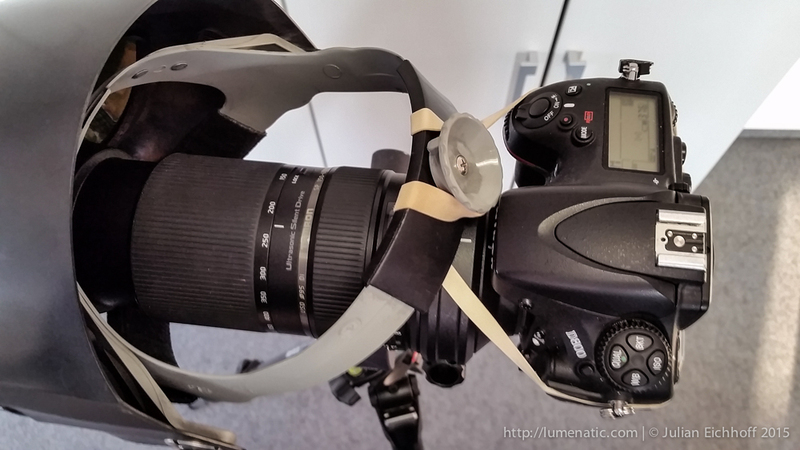 I mounted the Tamron 150-600 mm lens on my D800 and strapped the welding mask with a rubber band to the camera. The mask sat stable on the lens, only the rubber band prevented the lens from being locked at 600 mm – the tension pushed the lens back to approx. 460 mm. If I wanted to shoot at 600 mm I had to zoom manually and keep my hand on the zoom ring to prevent it from being pushed back. That way I shot many images and also made a short timelapse-video. The sun is green, and no contour is visible. Well, what did I expect. The sun does not have craters like the moon. Basically I photographed green pac-mans / smileys. On most images the sun is hardly recognizable as such. Through the smeared glass of the welding mask a sharp picture was next to impossible. 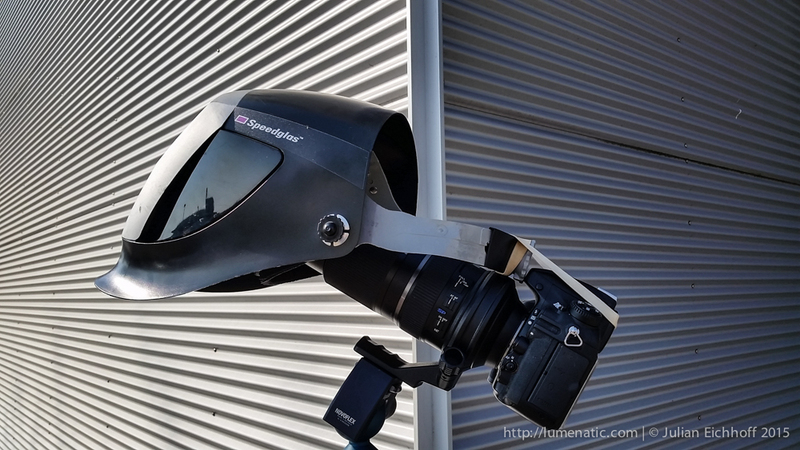 As mentioned above it was an active mask with a screen which is triggered in bright light. The construction has several layers, meaning several layers of glass, meaning a loss of sharpness. Due to bad preparation the results were not as good as they could have been. 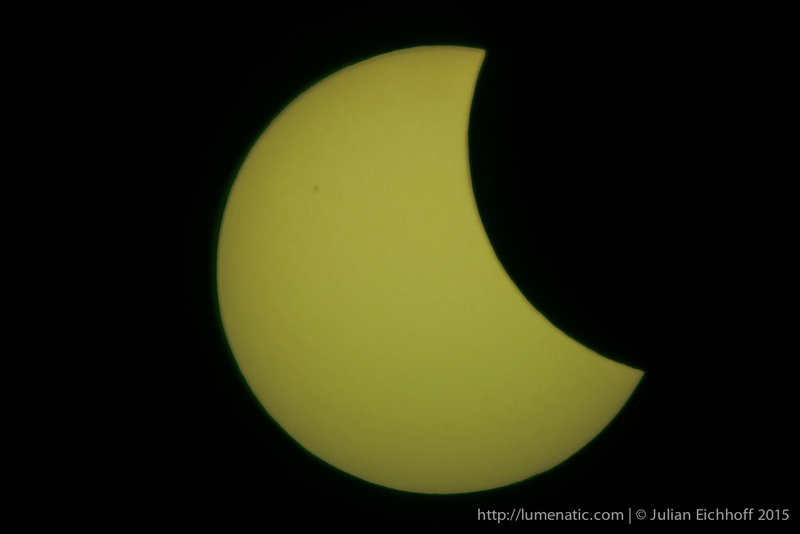 However I managed to take a timelapse video and show a sunspot. The main lesson I learn from this shoot is to prepare well (D’UH…) and use appropriate filter media (D’UH²). I found this post to be clever and helpful. 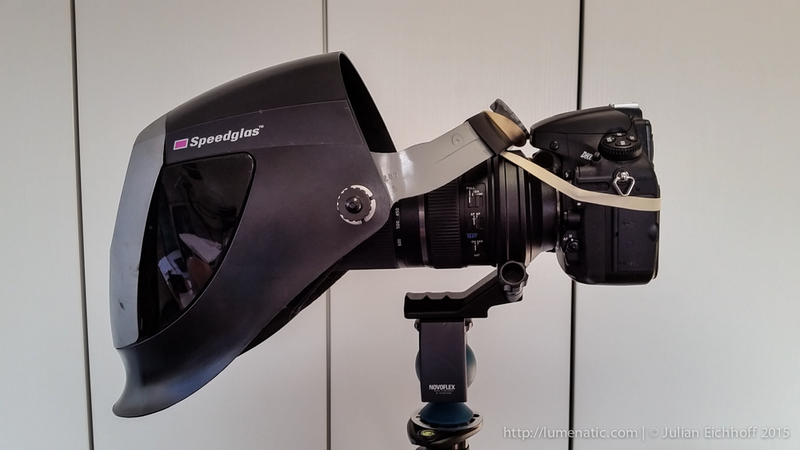 Have a look at how this photographer solved the problem of retina protection, glare and eye safety. Others might try this too! Cool!